There's only one way to take the ski slopes: fast. But there are all sorts of approaches to post-powder R&R. ; Here, Hemispheres looks at a trio of America's favorite winter resorts and offers three methods to après-ski—glitzy, old-school, and family-style—at each. There's something for everyone in the “after"-life. Tucked in a box canyon far from the hustle of Colorado's other ski resorts, highbrow yet rustic Telluride is two destinations in one. America's only free public-transportation gondola connects the Victorian mining town where Butch Cassidy robbed his first bank to the Alpine-style Mountain Village and its 2,000 acres of skiable terrain. You might bump into one of the many celebrities with vacation homes here (Oprah, Jerry Seinfeld), but play it cool: It's the Telluride way. Built on the edge of the mining town of Ketchum in 1936, Sun Valley was the world's first destination ski resort and the home of the first chairlift, which was derived from a device that had been used to load bananas onto rail cars. The mountain instantly began attracting the likes of Marilyn Monroe, Clint Eastwood, and Ernest Hemingway—a favorite adopted citizen who helped popularize the image of this valley as one of the West's great outdoorsy getaways. Perched on the edge of Grand Teton National Park, Jackson Hole has always felt wild. Trappers used the term “hole" to describe the valley's vertigo-inducing sides, and the resort has used that geological feature to maximum effect. Dubbed “The Big One," the area boasts America's biggest vertical drop in ski terrain (more than 4,100 feet), as well as Corbet's Couloir, a legendarily deranged run that tops many ski-bum bucket lists. St. Patrick's Day falls on a Sunday this year so the annual tribute to all things Irish will be celebrated in cities worldwide on the day of the March 17 holiday, as well as the day before, with a few events taking place the weekend prior. These seven parades and celebrations are among the world's largest and heartiest — don't forget to wear green. St. Patrick's Day is a legal holiday in Ireland, the island where it all began centuries ago. But the Irish spread the St. Patrick's Festival over five days (March 14 – 18), with 34 events ranging from street music and theater to Irish dancing and storytelling — and of course, a huge parade. Green lights illuminate the city's most iconic buildings and monuments, and yes, the Guinness flows fast and furious at Dublin's pubs. The Big Apple turns green each year for its St. Patrick's Day Parade. Since 1762, it's grown into the world's most populous parade, with about two million annual spectators. The March 16 parade (11 a.m. – 5 p.m.) follows Fifth Avenue between 44th to 79th Street, with the final 20 blocks alongside Central Park on the Upper East Side. This is a people's parade, with no floats or vehicles but with 200,000 people choosing to march or dance in the parade rather than watch. Chicagoans start celebrating in the early hours of the morning on March 16 — followed by the massive Columbus Drive parade (12 – 3 p.m.) through Grant Park that draws a million spectators. Before the parade, a tradition for 174 years, is the more recent tradition of the river dyeing, when eco-friendly green dye is poured into the Chicago River at 9 a.m.
Argentina may seem like an odd place for a big celebration of Irish heritage, but a half-million Argentines have Irish blood, and Buenos Aires has the world's fifth-largest Irish population. Like the Irish, South Americans know how to celebrate, and they do it in the Argentine capital with a parade and street party on March 17 that literally spills over into March 18. Ten city blocks are shut down for the music and dancing that last for hours after the short parade. America's oldest city parade debuted in 1737, when George Washington was a 5 year old. It is not on downtown streets, like most parades, but through South Boston where so many of the city's large population of Irish-Americans live. These “Southies" are among the throngs of more than a half-million who will watch the 40-block-long parade beginning at 1 p.m. on Sunday, March 17, on the holiday, but one day after Bostonians celebrate the holiday at Irish bars. Three years after the 1849 gold rush that brought thousands to San Francisco, the Irish-Americans among them organized the first St. Patrick's Day Parade. The parade has marched on ever since as the largest Irish celebration in the American West. About 100,000 will watch 5,000-plus parade participants march up Market Street on March 16 at 11:30 a.m., followed by an Irish cultural festival at the parade's end point at Civic Center Plaza. Savannah — population 145,000 — will swell to several times that size during its St. Patrick's Day Parade (March 16 at 10:15 a.m.). You can credit typically mild weather and a 193-year tradition for its popularity, but there's more. On March 9, there's a new festival that will be taken over the past Tara Feis events and will be called the Celtic Ceol Feis in downtown Savannah's Emmet Park. This will be a family oriented event that showcases the Irish culture and heritage in this city. And on March 15 – 16, Savannah's River Street and City Market host a music-filled St. Patrick's Day Festival that rocks till midnight nightly. Once you've decided where you want to spend St. Patrick's Day, book your tickets by visiting united.com or by using the newly improved United app. Skiing in the springtime is a popular destination for many, especially for families on vacation. There's just something special about the blue-sky weather conditions, softer snowpack and events for non-skiers that make it an impossible trip to resist. If you've been thinking about hitting the slopes with your family this spring, here are six destinations you won't want to miss. The oldest continually operated ski resort in Southern California, Snow Valley is the perfect spot for families with young children. Located 90 minutes from Los Angeles in the San Bernardino National Forest, this ski area features 13 lifts, 29 runs and 240 acres of skiable terrain. Best of all, the resort offers a popular Children's Learning Program that specializes in teaching kids between the ages of 4 and 12 the fundamentals of skiing and snowboarding. Conditions permitting, Snow Valley is open until the end of March, so families should plan to start their spring vacations here before moving on to other mountains. Featuring trails for every skill level, you won't find a more complete family ski destination than this iconic mountain resort — the largest of its kind in the western United States. Mammoth Mountain is currently experiencing one of the best snow seasons in recent memory, and it's projected to remain open until July 4. For non-skiing family members, the surrounding area provides fun activities like dog sled races, snowmobile rides, film festivals and brewery tours. Though primarily known as a winter ski destination, this charming resort on Mount Werner in the Routt National Forest remains open through mid-April, making it an ideal spot for families on spring vacation. Sporting a large and efficient lift system, Steamboat Resort offers almost 3,000 acres of powdery terrain to explore. The resort offers kid-focused ski lessons, and non-skiers can enjoy free concerts, wine tasting events, art walks and a gondola ride to the resort's highest elevation to experience one of the most incredible views in Colorado. Comprised of three incredible ski resorts, each with its own unique attractions, Park City offers a wide variety of terrain to enjoy. For parents of infants and toddlers, there's Little Adventures Children's Center, which provides licensed child care to kids as young as 6 weeks old. Those who don't ski can explore the surrounding village, which features some amazing dining, shopping and live music options on historic Main Street. Although Park City's spring season ends in mid-April, families who haven't had their fill yet of skiing in Utah can continue their vacation at the nearby Snowbird resort in Salt Lake County, which remains open until late May. With its high elevation and deep snowpack, this stunning alpine ski destination frequently extends its spring season well into May. More than half of the 50 named runs are recommended for intermediate skiers, making Crystal Mountain in Washington well-suited for families with prior experience. However, even children on their first ski trip will feel right at home thanks to slow family-safe zones that are monitored by the resort staff. Non-skiers can take snowshoe tours, enjoy scenic gondola rides and relax on a large, heated sundeck while listening to live music. Once you've chosen the perfect ski destination, book your tickets by visiting united.comor by using the United app. Similar to European cathedrals, Asian temples are impressive and intriguing. The history and religious traditions are as robust and complex as the architecture; some are taller than 20-story buildings and have stood for more than 1,000 years. These cities are the most accessible for explorations of many of Asia's most awe-inspiring houses of worship. The 33-temple pilgrimage route in Japan's Kansai region is dominated by Kyoto's 12 Buddhist temples, but also includes five or six each in Shiga, Hyogo, Nara, and Osaka—all easily reached from Osaka International Airport. Kyoto's leading temples include the aesthetically beautiful Temple of the Golden Pavilion, the hillside Kiyomizu-dera Temple, and the 13th-century Chion-In Temple. In nearby Nara are the Seven Great Temples, notably the ancient imperial temple, Yakushi-ji, which like most of Kyoto's temples are UNESCO World Heritage Sites. Many of Asia's most noteworthy temples are in India—mostly centuries-old Hindu temples. But Delhi's architecturally stunning Lotus Temple is the locus of the Baha'i faith and was completed in 1986. Twenty-seven massive marble “petals" envelop a 2,500-capacity hall that's open to visitors of any faith. It's been called the world's most visited building. Two of the country's other most renowned temples are also in northern India: the lakeside Golden Temple in Amritsar, the world's most revered Sikh temple, and the castle-like Jain Temple in Ranakpur, which is sacred to the Jains. Three special temples are found in Singapore, East Asia's wealthiest and smallest country — the country is smaller than New York City. The Buddhist Tooth Relic Temple and Museum is a visually dazzling building in Chinatown with a giant prayer wheel in the rooftop garden and what believers regard as the tooth of Buddha inside. The Sri Veeramakaliamman Temple in Little India is as lavishly colorful as its name is long. And Sri Mariamman is an exquisite white-and-gold temple that honors the goddess of rain. Seoul is a densely populated city of 10 million, yet tucked right downtown is an island of tranquility — the Jogyesa Temple, which has preserved Korean Zen Buddhism over the years. In the southern mountains of South Korea, meanwhile, travelers can visit the Three Jewels Temples — the most revered Buddhist temples in the country. Tongdosa Temple includes one building that was built 2,600 years ago, the Haeinsa Temple houses all of the Buddhist Scriptures on 81,350 wooden blocks and the Songgwansa Temple is an active monastery in a coastal provincial park. The same 15th-Century emperor who had the Forbidden City built — about 1,000 buildings which include his palace (now the Palace Museum) — also built the Temple of Heaven in Beijing. The central Beijing Taoist temple complex can only be described as mind-boggling. The park-like grounds include numerous ornate palaces, halls, pavilions, turrets, gates, gardens and ponds. Also in Beijing is the Lama (or Yonghe) Temple, a former imperial palace and now a temple and monastery for Tibetan Buddhists. Bangkok's three most popular attractions are conveniently all side by side in the city's historic district. One is the Grand Palace and the other two are grand temples. On one side of the palace is the Temple of the Reclining Buddha, named after the 150-foot-long golden Buddha that's housed in its own mural-decorated chapel. Also in the temple complex is Thailand's largest collection of Buddhas. On the other side of the palace is the Temple of the Emerald Buddha, named after a treasured Buddha carved from a single jade stone. United® flies to Osaka, Delhi, Singapore, Seoul and Beijing. United partner All Nippon Airways flies to Bangkok. Visit united.comor use the United app to make your temple travel plans. With Valentine's Day almost upon us, now is the time to think about expressing your love with something more than a card and a dozen roses. This year, you can always still buy a card and flowers, but if you're looking to do something different, you may want to consider a romantic weekend getaway. Head for the mountains for a couple of days away from it all, or visit a city for a weekend of culture and cocktails. Whatever your preference, there's a romantic getaway within easy reach. But if you need a little inspiration, here are five great options. For some, a romantic Valentine's trip involves escaping the cold February temps to find sun, sea and sand. For others, it involves embracing the winter conditions and escaping to a world of glaciers, rocky peaks and 600ft waterfalls. If the latter sounds more like you and your partner, head for Montana's vast Glacier National Park. It boasts 700 miles of trails, including a five-mile trail to the photogenic Hidden Lake, while winter also brings ice climbing, sleigh rides and hot spring pools. And at the end of a day of reconnecting with nature and the one or ones you love, head back to your lodging to sip on a cocktail and gaze up at the stars. Whether you choose a historic grand hotel, a mid-century 'motor inn' or a rustic cabin in the middle of nowhere, you'll discover that each comes with a sense of cozy romance. Stroll the cobbled streets and gas-lit alleys of its French Quarter and Battery district, and it's easy to see why Charleston has been called America's most romantic city. Historic, effortlessly elegant and easily walkable, the city appears to have been laid out like a film set with rambling romantics in mind. Explore historic downtown or the gardens and plantations that bloom in the winter months, snuggle up on a carriage ride and then watch the sun set over tidal creeks at Bowen's Island Restaurant. Sleep at the historic Jasmine House Inn, then wake and do it all again. The only downside of a plan such as this is that a weekend won't ever be enough, and you won't ever want to go home. Often, the best romantic escapes are based on illusions —the illusion that you've discovered your own private hideaway, that you've taken a step back from the modern world, that time has somehow slowed down. Those illusions all appear true if you check in at the Calistoga Ranch resort. Set over 157 acres in a secluded Napa Valley canyon, you'll find the space to be 'alone' despite the presence of other like-minded romantics. Check in at a lodge where the trees twist up through the floorboards and the outdoor bath garden blurs the line between indoor and outdoor. With every modern convenience, you'd hope for in a luxury resort, this is 'back to nature' done right. Situated in a region renowned for its wines and fine dining, add in world-class spa treatments, multiple hillside trails for the energetic adventurers and the option to follow a sunrise hot air balloon ride with a champagne breakfast, and you'll be taking Valentine's to a whole new level. And that won't be any illusion at all. It's all too easy to overlook New York City as a romantic option because it's, well, just too obvious. But sometimes obvious is obvious for a reason. From gazing down from the top of the Empire State Building to strolling hand-in-hand through the Brooklyn Botanic Garden, to a million-and-one magical moments that only seem possible in the Big Apple, NYC has romance covered from every angle. With options this endless, you may be wondering where to start planning your trip. Here's what we'd suggest: check in at an iconic hotel such as the St. Regis or the Soho Grand, take a carriage ride through Central Park or ice skate around the Rockefeller Center, order cocktails at a speakeasy, enjoy oysters in Grand Central Terminal and dinner at River Cafe, as the lights of Manhattan sparkle down on the East River. New York is a city packed full of romantic adventures. The story you write is up to you. If a romantic break means chilling out and recharging, head to Scribner's Catskill Lodge, 100 miles north of New York City. Perched high on a hill in The Great Outdoors, head here for a cozy weekend where rest and relaxation is strongly encouraged. Hiking, skiing and zip-lining will satisfy the thirst of the outdoor adventurers, while spa pampering, the Mountain Cinema and Scribner's own Whiskey Lounge offer a more leisurely alternative. Truth be told, while it calls itself a lodge, Scribner's has the feel of a chic boutique hotel, where every luxury is available. Book the Scribner's Suite for the full romantic effect. The 600-square-foot signature suite boasts a queen bed, sunken living room with fireplace and an oversized private terrace with mountain views. Sit here, huddle close and watch the sun sink behind the mountain peaks. United Airlines offers nonstop flights from U.S. cities to all of these romantic getaways. 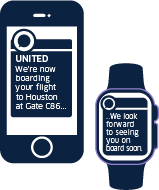 Visit united.com or use the United app to book your flight. My first take to the skies on the outside of an aircraft was eight years ago. In 2010, the idea to go wing walking came into my head as I was visiting my mother in the United States. We stopped at a small airport cafe for breakfast. While looking over the menu, certain dishes had nicknames like "the pilot," "the flight attendant," and there it was..."the wing walker!" I thought, "Hmm, that would be fun!" After a lot of research, I proceeded to the outskirts of London, where there was a wing walking operation. At the time, it was the only place in the world to do any type of wing walking, unless you were a professional wing walker. One type of wing walking includes being strapped into a standing position on top of an old Boeing Stearman biplane and from there you take off, riding on top for the entire flight. It was a fantastic experience that I enjoyed immensely. Eight years had past when I heard about a place in Washington state that teaches wing walking, where you can walk out on the wing during the flight. I knew I had to do it, and what better occasion than to celebrate my 50th birthday? I flew to Seattle and rented a car for the two-hour drive to the small town of Sequim. This beautiful town is surrounded by fields of lavender and is home to lovely people. When I arrived at Mason Wing Walking Academy bright and early the following morning, I found two Boeing Stearman planes in the hangar. The wing walker greeted me and, since I was the only person who had signed up that day, we immediately began training. The entire morning was spent reviewing and practicing the wing walking moves I would make. Over and over, I practiced learning what to do and not to do in flight. After training all morning and into the early afternoon, the pilot arrived, flying in with his own plane. I learned his other job was as a UPS 747 cargo pilot out of Anchorage, Alaska. That put my mind at ease about his flying abilities. Once he had the biplane ready to go, I climbed in the front seat (as the pilot flies from the back). We took off quickly from the short grass strip, and it wasn't long before we were enjoying the views. The Olympic Peninsula and the gorgeous Strait of Juan de Fuca, which separates Canada and the United States is stunning. The water was a beautiful shade of blue. Upon reaching the appropriate altitude and slowing down to just above a stall speed, the pilot wagged the wings, letting me know it was time to get out. I looked back to see him giving me the thumbs up. With that encouragement, I left my seat and grabbed the two hand holds above me, fighting the wind the entire time. I carefully made my way up between the cables above me to the pole on top of the plane. I leaned against it and buckled into the four-point harness. After giving the thumbs up, the pilot proceeded to do aerobatics, including loops, barrel rolls and hammerheads. I hung on to the pole for the first loop, but after the first one was completed successfully, I threw caution to the wind and held out both arms! After enjoying the weightlessness of aerobatics, he eventually returned to straight flight so I could enjoy the view. He wagged the wings again, letting me know it was time to come back in. After slowly retreating to my seat, making sure I had three points of contact with the plane at all times, I buckled in once more. You wouldn't think wing walking is exhausting, but it is. I was given time to recuperate and, once ready, headed out again, this time to the lower wing. This exit was much more challenging as once outside and on the left wing, the prop blast was fierce. I eventually made it to the javelin, which was located between the cables in the middle of the wing, and wedged myself in. This position didn't have a harness; however, I was so wedged between all the cables, I wasn't going anywhere. Once I gave the thumbs up, we were doing aerobatics once more. My favorite was the hammerhead, which is flying straight up for some time, a rotation and then straight down. After much flying around, the pilot once again wagged the wings, indicating that it was time for me to come back to my seat. I could have spent all day in the sky, but soon enough my time was finished. I slowly climbed back into the plane, making sure to step where I was instructed. The wing of a Boeing Stearman is partially canvas so one step in the wrong place and your foot would make a hole in the structure. I made it back to my seat without incident and strapped myself in one last time. The pilot brought us back to the grass strip and the hangar as I smiled from ear to ear. The professional wing walker congratulated me upon our arrival. People often ask if I was tethered to the plane. Yes, I was. I had a long cable attached to me and the strut of the plane at all times. However, it's imperative that you take the training seriously and are careful while moving around in the air. My time wing walking in beautiful Sequim will live on in my memory until my last day. You simply don't forget one of the best days of your life!